This is the time of the year when there are many family and friend get-togethers. I love anything pumpkin and this is one of my favorite fall party foods. I love to take it to parties as my dish to pass. It is quick and easy to put together and when you serve it in a little pumpkin it is very festive for the season! There are a ton of versions of this recipe out there, but this one from Taste Of Home is delicious. It tastes like pumpkin pie but it is a quick and easy dip. I make mine using their recipe and like to serve it with Nilla Wafers, Ginger Snaps, and little Graham Crackers. The kids love it when I pair it with Scooby Snacks (which are little dog bone shaped graham crackers). It adds a little extra fun to the dipping process and they are very tasty with the dip. I also carve out a little pumpkin to serve the dip in. 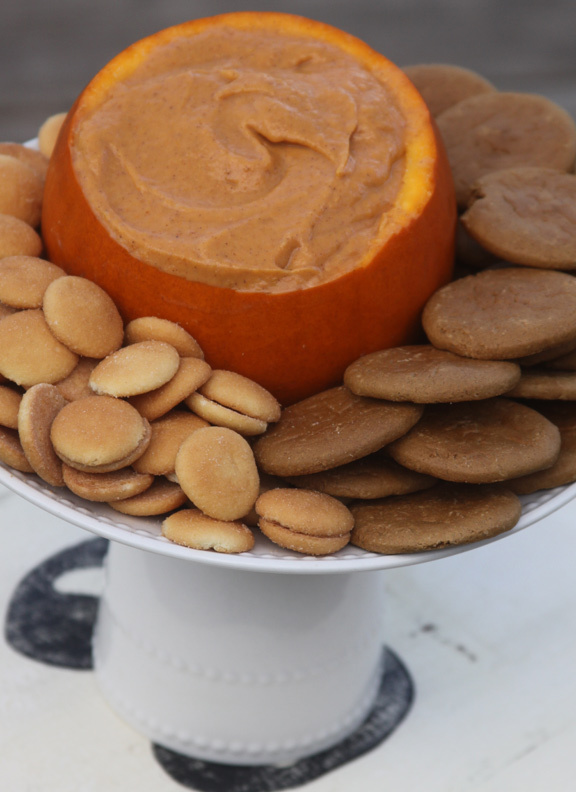 Just cut of the top in a circle and scrape out the inside to create a cute little pumpkin bowl to add your dip to. Beat the softened cream cheese with the powdered sugar. Gradually add the pumpkin, pie spice, vanilla and ginger; beat until smooth. Serve Graham Crackers, Nilla Wafers, or Ginger Snaps. Refrigerate leftovers. Made this once at home and it was a hit. I did add a bit of cinammon to the recipe too. Planning to make it again for a family Thanksgiving gathering. I can make it ahead of time and it’s rather easy to travel with. Good for game day grazing. Thanks for sharing.